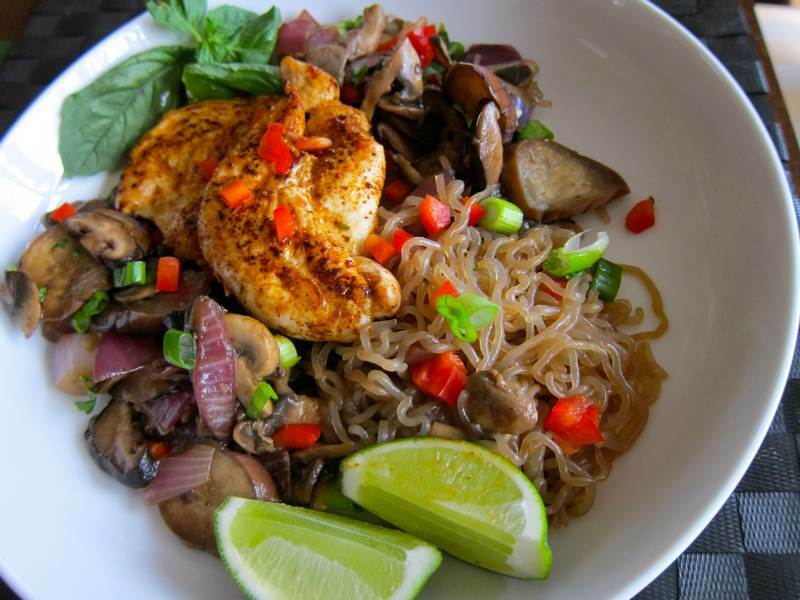 What’s so special about shirataki noodles, you ask? I’ll tell you: They’re made from Japanese yam flour and are grain and gluten-free. 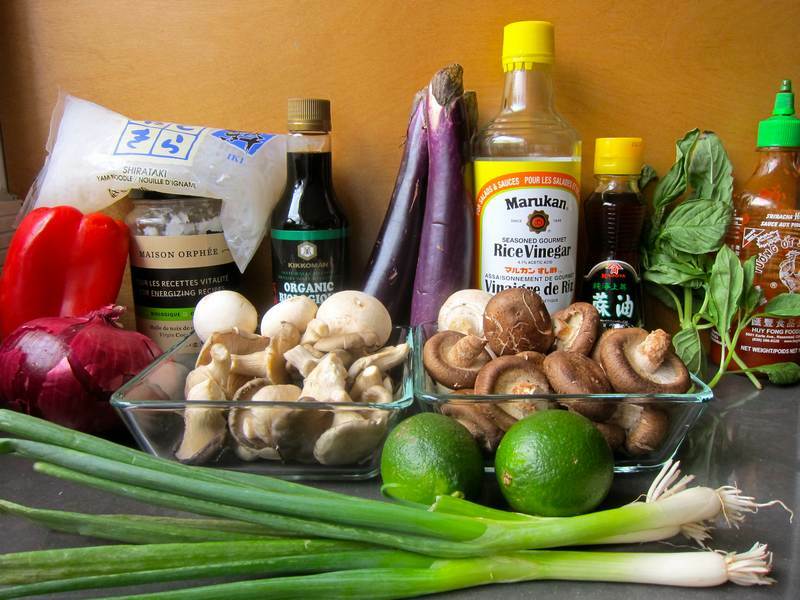 Japanese noodles, Japanese eggplant, Japanese mushrooms. Saki anyone? Add chicken, fish, shrimp, beef or tofu if this all-veggie version is too minimalist–that is, too Japanese for you. Add oil to a large frying pan on medium-high heat. Sauté onion, mushroom and eggplant until softened, about 8 minutes, adding two tablespoons each of soy sauce and rice vinegar half way through. Transfer vegetables to a platter and garnish with a teaspoon of sesame oil. Add the noodles to the hot pan along with 2 tablespoons of the soy sauce. Cook, stirring for about 8 minutes. Add a tablespoon of the rice vinegar. Remove from heat. 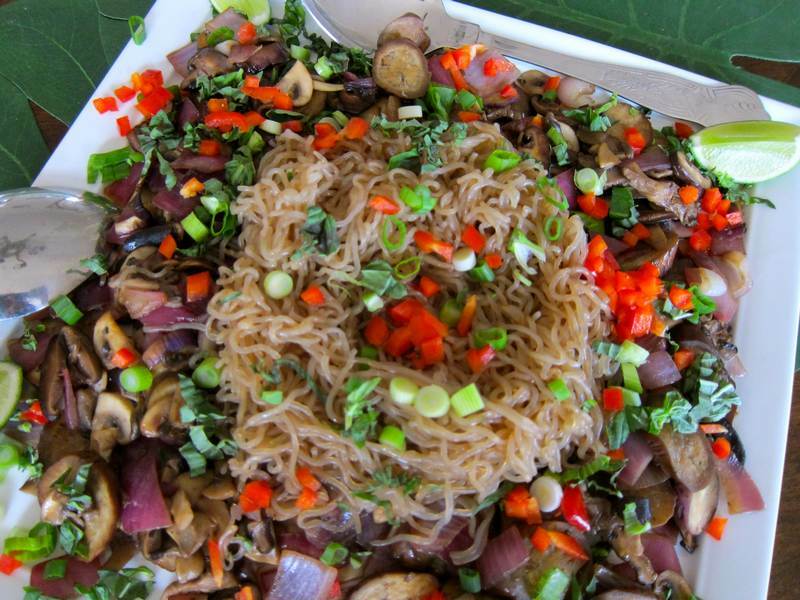 Serve noodles on top of the vegetables and garnished with peppers, cilantro and scallion. Offer lime and Sriracha sauce on the side. Serves 3-4. Wondering how to prepare fresh shiitake or oyster mushrooms? You should remove the stems of the shiitake, reserving them for soup stock. Want to know which onions to choose? As an onion lover, I’m delighted to discover how healthy they are. Not remotely Japanese, more like Scottish-Italian, but I’ve been listening to Paolo Nutini and I think you should, too. New Shoes kept me company as I “jogged” (you could walk faster) on the mountain in my new shoes. « Party Finger Food – Pamper Everyone! Thanks Donna! This one is vegan! So yum!! Well i have never been more inspired to try those soggy looking noodles in a bag…you’ve turned the frog into a prince. Where do you buy your shirataki noodles in MTL? ?